On Monday July 9th at the House of Microfinance, the Luxembourg Ministry of Foreign and European Affairs – Directorate for Development Cooperation and Humanitarian Affairs welcomed Mr. Peter Maurer, Secretary General of the International Red Cross Committee (ICRC) to discuss new financing models for humanitarian settings. Among the panellists were InFiNe.lu members, Katharine Pulvermacher (Microinsurance Network), Jean-Philippe de Schrevel (Bamboo Capital Partner), Tom Théobald (Luxembourg for Finance), and Sachin Vankalas (LuxFLAG). The discussion was moderated by Maximilian Martin, Lombard Odier’s Global Head of Philanthropy and led the ICRC’s Program for Humanitarian Impact Investment. With more and more conflicts and humanitarian crises in the world, the ICRC budget has doubled from 1 to 2 billion. In addition, ICRC is dealing now with long term displacement of people and disruption in the health, and social systems. The observation is clear: the traditional models of financing with the single support of governments and donators is not enough anymore. Based on that conclusion, the ICRC decided to test a new financing scheme: “Humanitarian Impact Bond”. This bond has been launched in September 2017 and is initially used to build and run new physical rehabilitation centres in Africa (Nigeria, Mali and Democratic Republic of Congo) over a five year period. This new economic model has been created to encourage social investment from the private sector. 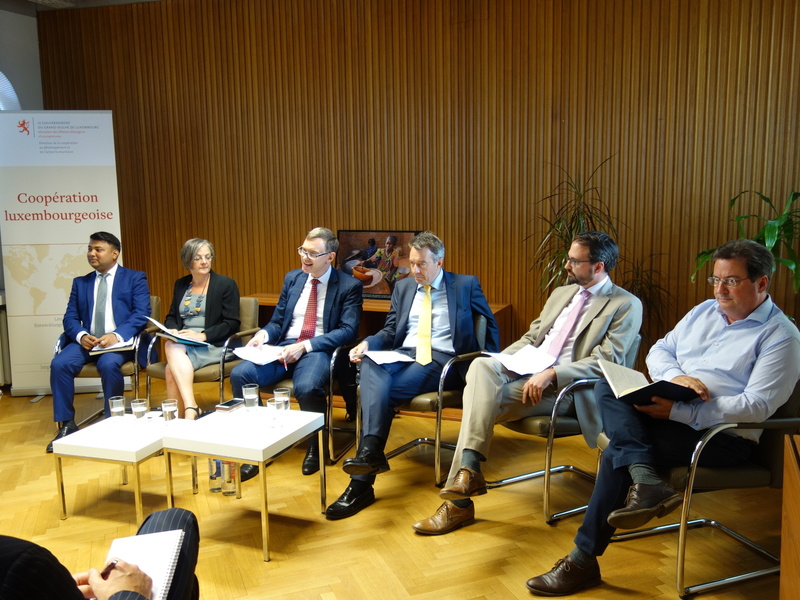 The panellists discussed how Luxembourg as leading domicile for responsible investment funds and financial centre can bring its knowledge to develop new financing scheme for humanitarian settings and tackle the challenges to invest in projects in such specific environment. The suggestion was made to learn from the Luxembourg experience in the field of inclusive finance funds and green bonds and to see how these initiatives might be replicated in humanitarian settings, and to explore further the link between climate finance and humanitarian settings.